It is not clear how Mr. Dearborn handled the outreach. He forwarded a similar proposal, made through Rick Clay, an advocate for conservative Christian causes, to Jared Kushner, the president’s son-in-law and a top campaign aide. Mr. Kushner rebuffed the proposal at the time, according to two people who have seen Mr. Kushner’s email. Mr. Sessions told investigators from the House Intelligence Committee that he did not recall the outreach, according to three people with knowledge of the exchange. Mr. Dearborn did not return requests for comment, and Ty Cobb, the White House lawyer dealing with matters related to the investigations, declined to comment. Repeated attempts to reach Mr. Erickson were not successful. Intelligence agencies have concluded that Russia, on orders from the highest levels of its government, undertook a sophisticated campaign to hack Democratic computers, spread propaganda and undermine the candidacy of Hillary Clinton. The repeated outreach around the N.R.A. convention, where Mr. Trump accepted the group’s endorsement, came just weeks after a self-described intermediary for the Russian government told George Papadopoulos, a campaign aide, that the Russians had “dirt” on Mrs. Clinton. And just weeks later, the president’s eldest son arranged a meeting at Trump Tower with a Russian lawyer who promised damaging information about the would-be Democratic nominee. Alexander Torshin, a deputy governor of the Russian central bank and key figure in Mr. Putin’s United Russia party, was instructed to make contact with the Trump campaign. Mr. Erickson, a longtime conservative operative who has been involved in several presidential campaigns, presented himself in the email as a well-connected intermediary to the upper reaches of the Russian government. By “happenstance” and the reach of the N.R.A., Mr. Erickson wrote, he had been put in position to “slowly begin cultivating a back-channel to President Putin’s Kremlin” in recent years. “Russia is quietly but actively seeking a dialogue with the U.S. that isn’t forthcoming under the current administration,” he wrote. Mr. Erickson has known Maria Butina, a former assistant to Mr. Torshin and the founder of the Right to Bear Arms, a Russian gun-rights group, for several years. Ms. Butina, who helped Mr. Torshin make the request through Mr. Clay, hosted Mr. Erickson at a September 2014 meeting of the group at its Moscow office. And in February 2016, the two incorporated a company, Bridges LLC, together in South Dakota. What the company does is unclear. In December 2015, Mr. Erickson returned to Russia as part of an N.R.A. delegation that included David Keene, the group’s onetime president, top donors and David A. Clarke Jr., the former sheriff of Milwaukee County who became a popular Trump campaign surrogate. At one stop, the group met with Dmitry Rogozin, the deputy prime minister in charge of defense. A photograph from the meeting shows Mr. Torshin was also present. In the United States, the hospitality was returned. Mr. Torshin and Ms. Butina attended the N.R.A.’s annual convention in 2014 and 2015. Ms. Butina told the conservative news site Townhall that she attended the N.R.A. Women’s Leadership Luncheon as a guest of Sandra S. Froman, a former president of the group. And in 2015, she was given a tour of the N.R.A.’s Virginia headquarters. Attempts to contact Ms. Butina were unsuccessful. Mr. Erickson does not explicitly name Mr. Torshin in the email to Mr. Dearborn, but the message appears to refer to him, the people familiar with the communication said. Instead, he describes “President Putin’s emissary on this front,” whose plans match those of Mr. Torshin. Mr. Torshin, he wrote, was planning to attend a reception being planned by Mr. Clay honoring wounded veterans that he expected Mr. Trump would also attend. 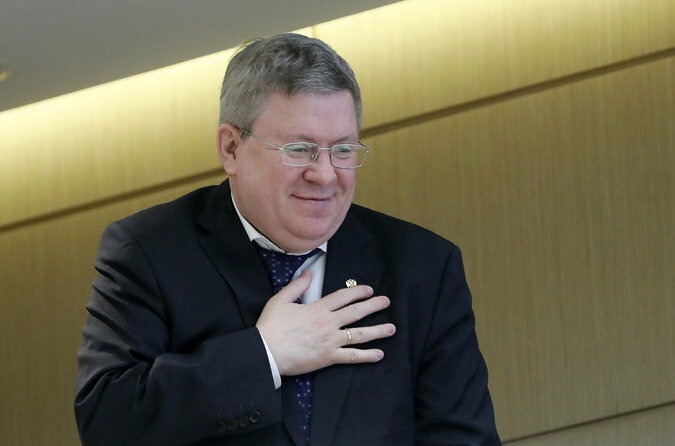 Mr. Torshin expected to use the reception to “make ‘first contact’” with the candidate and present Mr. Trump’s wife, Melania, with a gift from the Russian Orthodox Church. According to Mr. Clay, neither Mr. Trump nor his campaign officials attended the veterans’ dinner. The president’s son, Donald Trump Jr., and Mr. Torshin did attend a separate N.R.A. dinner that night. Mr. Torshin served in the upper house of the Russian Parliament and was a member of the country’s National Anti-Terrorism Committee, a government body that includes the ministers of defense, interior and foreign affairs and the director of the Federal Security Service, known as F.S.B., the K.G.B.’s successor. He has been a leading advocate of gun rights in Russia and of more closely linking the government and the Russian Orthodox Church. Spanish investigators say that while he was in Parliament, Mr. Torshin laundered money for the Russian mafia through Spanish banks and properties. Mr. Torshin has denied those accusations.